You can order this in your choice of fabrics. We have the fabric swatch books at our store. Loveseat dimensions: 57" wide x 35" high x 30.5" deep. Seat height is 19". 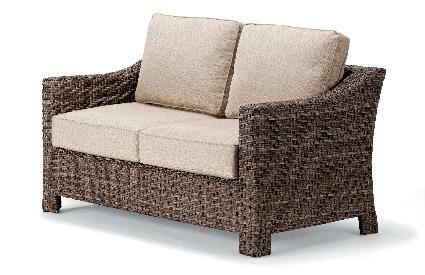 Shown in photo: Driftwood wicker with Linen Champagne value acrylic fabric on the cushions.